It’s been over two years since the team at Sangoma set out to give FreePBX a facelift, and over a year since we completed that goal when FreePBX 13 went stable. 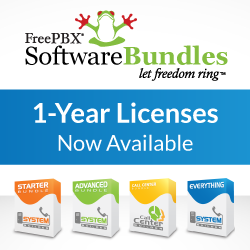 In the last 12 months, we’ve implemented hundreds of new features for FreePBX 13 while continuing to grow our Unified Communications product lines through Zulu. We released 6 formerly commercial modules as open source, emphasizing our support of open source. We’ve also added over 41,000 lines of new code while welcoming an additional 18 new contributors. We also introduced Edge Mode for bleeding-edge module upgrades, support for Asterisk 14, improved reload times, self signing of modules and a new improved certificate manager that supports Let’s Encrypt. While adding all those new features, we’ve also fixed (at time of writing) 1185 reported issues. For a full list of everything that was accomplished during our 13-release checkout our roadmap. One of the biggest problems we’ve run into over the past few years working on FreePBX 13 was the fact that we were basing FreePBX 13 around the PHP 5.3 platform. PHP 5.3 was released June 30th, 2009. With the release of FreePBX 14 we now require PHP 5.6 which was released August 28th, 2014. That’s over 5 years of improvements, which has resulted – among other things – in considerable performance improvements with 14 compared to version 13. Due to this massive internal change, FreePBX 14 is now recommended to be installed on the Sangoma 7 distro. Of course, manual and custom installations of all versions of FreePBX are still available, but the legacy Schmooze Distro (Cent 6.6) will not be able to upgrade to FreePBX 14 instantly, as it requires an Operating System Upgrade to Sangoma 7. More information about this will be coming in a few weeks. One of the first changes we made in FreePBX 14 was to let systems automatically update modules that have security vulnerabilities. This will ensure that when we release updates to modules that have security issues, your systems will be updated to prevent those security issues – in less than 24 hours! We’ve made this option opt-out, so you can disable it through Advanced Settings if you desire, but we recommend against it! The days of running distro upgrade scripts or having to go deal with stuck upgrades are over. In FreePBX 14 all system upgrades are done right through the GUI, in the same place you’d normally go to update modules. You can also schedule automatic module or system upgrades at specified dates and times. Sangoma Technologies is a global company with over 150 employees worldwide. We realized that United States of America date formats don’t work for many countries and locals. FreePBX now comes with the ability to define the time zone, language and date/time formatting system wide, per group and/or per user. Each user can also individually define and change these settings from within UCP. FreePBX 14 now also supports a broader scope of UTF8 which means you can now save settings in FreePBX with emojis! For a long time, we’ve heard different scenarios of complex time conditions logic to deal with holidays such as Easter (which falls on a different day every year). To solve this in 14 we implemented a calendar module. This module allows you to add any web based iCal, CalDav, Google or Exchange Web Services calendar. You can also add local calendars through which you can add custom events. These calendars can then be linked to Time Conditions, Paging Pro groups, Find Me/Follow Me enabled/disable events and more! To learn more about the new Calendar Module see: http://wiki.freepbx.org/display/FPG/Calendar+Module and http://wiki.freepbx.org/display/FPG/Calendar+Event+Groups+Module. Remote calendars can be updated on a specific schedule you define. This allows you, the administrator, to delegate a calendar out to your users that they could update, adding events when the office is open which will then trigger Time Conditions at the appropriate times. We hope this new feature helps to ease configuration and management of your FreePBX systems. Starting with the addition of the ARI back in the 2.x era, FreePBX has long had a need for a User Control Panel. A place where your end users can go to change specific settings related to their accounts or listen to voicemails or call recordings. In FreePBX 12 we completely overhauled the UCP interface to give it important HTML5 updates. Including in-browser playback of recordings, notifications, a responsive interface, native chat and an in browser WebRTC phone. In FreePBX 14 we’ve gone one step further by giving your users complete control over how their Control Panel looks and feels. 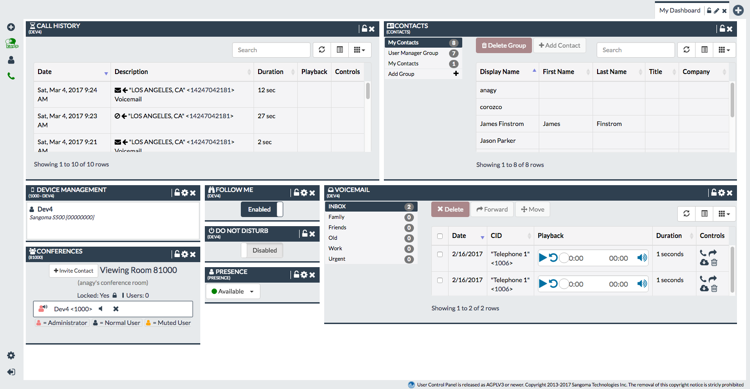 With the additions of dashboards and widgets users can add, remove, resize and organize how they want their dashboard(s) in UCP to look and function. Users can have multiple dashboards that have different configurations of widgets. You could have one dashboard for your voicemail boxes and another dashboard that has widgets for your queues. For more information on the new UCP and what’s changed click here. Six months ago, we decided to open source our XMPP chat module but promised to continue improving the underlying source code. Staying true to this promise we have completely reworked the internals of our XMPP module. Our new chat engine is more robust than ever and is fully supported by our flagship UC Zulu product line. Support for group chats, avatars, message history and more is already supplied in XMPP and best of all it’s free! 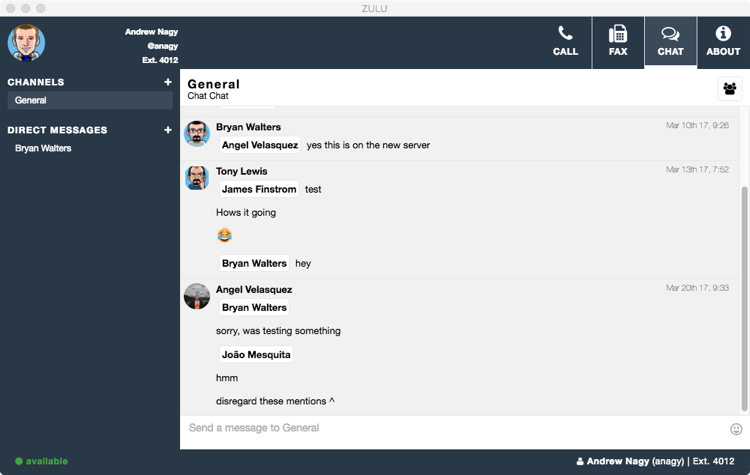 Zulu already supports these outstanding features and in the next few months the UCP chat interface will also support rooms, avatars and message history. We are very excited with how Zulu has progressed and how it’s also helped to expand the FreePBX Open Source Portfolio. In the next six months, we hope to release a Beta of FreePBX 15 with a redesigned backup module that will no longer be required to restore from the same version you are backing up to. This will also start our quicker release period where major FreePBX releases will happen every 6 months. It wasn't an ukulele, it was a mandolin, and I've already apologized once. Sheesh. Is there an upgrade script available yet? I'd like to test but don't want to wipe all my settings. You can not go to PHP 7 with FreePBX. Have to stick with 5.6 for now. @qoole While I understand the comment, keep in mind that if users want to use a new version of PHP such as PHP 7, there is nothing stopping them from using FreePBX with PHP 7 and reporting issues to us at issues.freepbx.org.